The Mazda CX-5 proves itself to be a superb tow car for a wide range of suitably matched tourers. Fresh off the boat, the Mazda CX-5 arrived just in time for this year’s Tow Car Awards. Now we’ve had the chance to spend longer with the car on the road and at the test track in the range-topping 2.2D 175PS AWD Sport Nav, to truly understand what tow car potential it has. With four-wheel drive, these cars should have no problem towing caravans in all kinds of weather. We’re looking for engines with enough pulling power for any suitably matched tourer, and cabins that are practical and spacious for families. Stick to the 85% guideline, and the Mazda CX-5 will pull plenty of mid-sized caravans. It is legally permitted to pull almost 400kg more than it weighs, but Practical Caravan’s testers strongly recommend towing no more than its kerbweight, even if you’re an experienced caravanner. It also has an 88kg towball limit. The 2.2-litre diesel engine is gutsy, too, producing 173bhp and 309lb ft of torque. Matched to a Sterling Eccles Sport 524 with a maximum technically permissible laden mass (MTPLM) of 1405kg, the Mazda pulled from 30-60mph in just 10.6 seconds and, when in fifth gear, needed 7.6 seconds to roar from 50-60mph, as you might after being caught behind slower traffic on the motorway. The Mazda’s punch is obvious, whether holding top gear comfortably up a motorway incline or overtaking decisively. 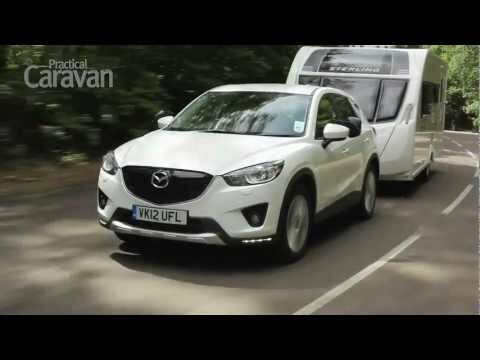 The testers conducted the brake test in bone dry conditions, and the Mazda CX-5 needed just 10.4m to stop itself and the caravan from 30mph. Its brakes were easy to apply smoothly for less-urgent deceleration. Our emergency lane change test was no problem either. The Mazda’s steering is somewhat heavy and direct, so it leaned a little when really pushed. It had no trouble pulling the caravan straight again. In a straight line at speed, the Mazda kept the van under constant control, so long motorway journeys shouldn’t give rise to nervous moments. We’d be content to rack up many miles towing with it on our caravan holidays. If you’re caught in traffic on a steep hill, the CX-5 can cope. Remember to yank the Mazda’s handbrake on firmly, though, because it can slip if pulled gently. Still, we noticed no vibration through the clutch pedal. It had enough muscle to tow up the 1-in-10 slope in first gear and in reverse. With its strong acceleration, dependable brakes and powerful engine, the CX-5 proves itself to be a superb tow car for a wide range of suitably matched tourers. As a solo drive, the Mazda CX-5 can be rewarding on, for example, an empty B-road. The meaty steering, plentiful grip, purposeful turn-in and little roll all won the approval of our reviewers. As when towing, the Mazda’s extra performance is immediately obvious. There’s rarely any need to use full throttle when the CX-5 has so much muscle in reserve. When you’d rather cruise along, the CX-5 feels less at home. Top-spec Sport models come with big 19in alloys, which combine with firm suspension to give a ride that is overly stiff at low speeds. It’s a trait that is more apparent when not towing, given the impact of a caravan’s weight at the rear. There are drawbacks, though, such as the wind and road noise at speed, which may be fine for a quick sprint down the motorway, but not a long journey. The Mazda CX-5 punches above its weight in space for passengers and luggage. Leg and headroom are generous in both the front and the rear, where knee room is particularly noteworthy. The CX-5 is also quite wide, which allows greater shoulder room if three passengers share the back seat. Unfortunately, the Mazda lacks air vents for them. The boot has 503 litres of loading space when the rear seats are upright, and 1620 litres when they are lowered. Folding the seats flat is a quick and uncomplicated job, thanks to levers on either side of the luggage space. These release the spring-loaded seat backs. The resulting load floor isn’t completely flat, but it’s not far off. Turn your attention from practicalities for a moment and you’ll spot the Mazda’s primary fault: finish. The cabin has too many hard and shiny plastics, which give it a cheap look. On the other hand, metallic rings for the dials and piano-black inserts give the dash a sporty look. There are plenty of toys provided as standard equipment, including controls on the steering wheel for the trip computer, cruise control, the stereo and phone connected via Bluetooth. A sat-nav comes as standard, too, but the screen isn't very large. Meanwhile, the gearshift console hosts one cupholder, but two would have been preferable. Nevertheless, the Mazda does prove itself as a practical and comfortable car. Despite what you’d expect, given the marque, the Mazda CX-5 is not inexpensive. And the manufacturer provides a lot for the price. Among the goodies on the standard kit list are a sat-nav system, leather upholstery and heated seats. Three years down the road, you’ll get back an impressive 47% of what you paid for the CX-5 when it was new. The Mazda sits in insurance group 23, but you’ll save on fill-ups: on Practical Caravan’s towing economy route, the Mazda returned 32.3mpg, and 54.3mpg on the official combined cycle. Reassuringly, the CX-5 was rewarded five stars – full marks – from the crash-test experts at Euro NCAP. So, despite being pricey and attracting higher insurance charges, the Mazda is still economical to run and holds its value well. There are plenty of reasons for adding the Mazda CX-5 to your shortlist of candidates, when wondering what tow car to buy next, starting with a gutsy engine that makes towing seem effortless. Unhitch the caravan and the CX-5 is entertaining to drive, although the downside is an over-firm ride. And regardless of whether you’re towing or not, the car gives you impressively efficient fuel consumption. Inside, the Mazda lacks the luxurious, pampering feel of a prestige brand, but it’s a supremely practical car. The cabin is generous with leg and headroom in the front and rear seats, and provides ample luggage space. It is also wonderfully well equipped, which justifies a price that exceeds those of more luxurious rivals. This alone would give the Mazda an edge over other tugs you may consider buying.